We’re back for our third and final installment on street art, in which we will be discussing current street art outside of North America. We have already looked at the history of street art as well as its expression in the United States, but street art is truly a worldwide phenomenon. We have based some of this post on our travels abroad, while other examples have caught our eye while researching our other blog posts. We first encountered extensive amounts of street art in Melbourne, Australia. Influenced by New York’s street art scene, the medium began to grow rapidly in the 1970’s and 1980’s. Stencil art became particularly popular in Melbourne during this time. In fact, Melbourne held the first ever Stencil Festival in 2004, which ran over the course of 10 days in late September and early October. Melbourne’s downtown is characterized by alternating streets and alleyways. The alleyways, in particular, have become canvases for street art both sophisticated and crude. One notable alleyway, ACDC Lane, celebrates rock music and more specifically the famous rock band AC/DC, which was formed in Sydney, Australia in 1973. ACDC Lane is also unique because it includes the Cherry Bar, a music venue that reflects the art outside. Another alleyway featuring prominent street art is Hosier Lane, in the southern part of the city. Hosier Lane is particularly notable due to the quality of the street art found there, as well as the political nature of much of the work. You can find pictures of ACDC and Hosier Lanes below. Beyond Melbourne, there are a number of other international cities that feature street art prominently. In Europe, Stavanger, Norway has held a yearly NuArt street festival since 2001 in which people volunteer to have the walls of their homes painted, often resulting in commentary on local issues. For example, there are several works that relate to the city’s dependence on oil as well as its whale hunting tradition. Viewed as one of the leading street art festivals in the world, the event, according to its website, aims to challenge ideas about what art is and what it can be. In Cairo, Egypt, politically-influenced street art began to explode following the country's revolution in 2011. 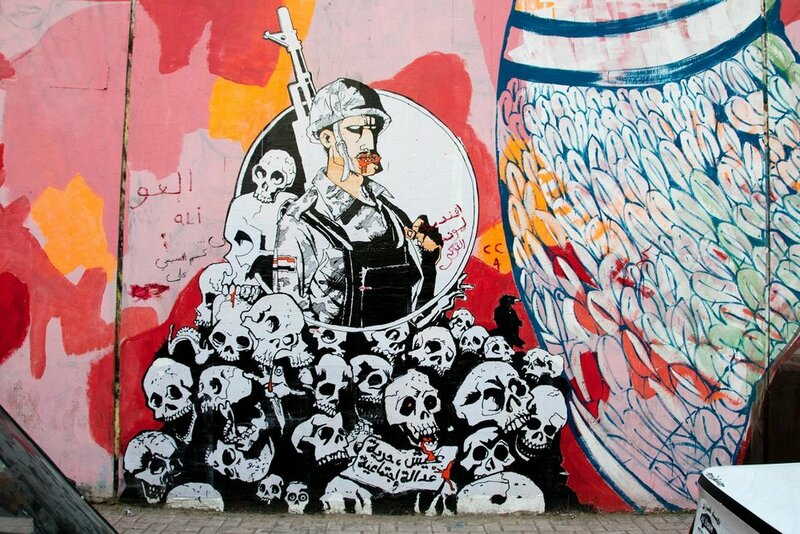 The street art movement began as a way to document the crimes committed by the regime of Hosni Mubarak. This resulted in a cyclical process in which street art provoked the government, resulting in more crimes which in turn increased the amount of street art in the country. One particularly interesting instance was the walls of American University, which was used by activists as a “newspaper.” Unfortunately, the most controversial work from this movement has been removed, including that on the walls of American University. In Bangkok, Thailand, the city greets visitors from the water with murals created during the city’s Bukruk Urban Arts Festival, which runs for 10 days and features art exhibitions, artist talks and an animation night in addition to the creation of public wall paintings. Much of this art is inspired by the people of Bangkok as well as the landscape of the city. Bangkok is unique in that while in many places one must seek out the street art of the area, its street art greets those entering the city. Over the past few decades, street art has exploded globally. The cities above are only a few of the many cities that have a significant street art presence. With this increase a variety of groups, including those whose voices have historically been muted, have had the opportunity to express themselves to a wide audience. We can’t wait to see where street art goes from here!